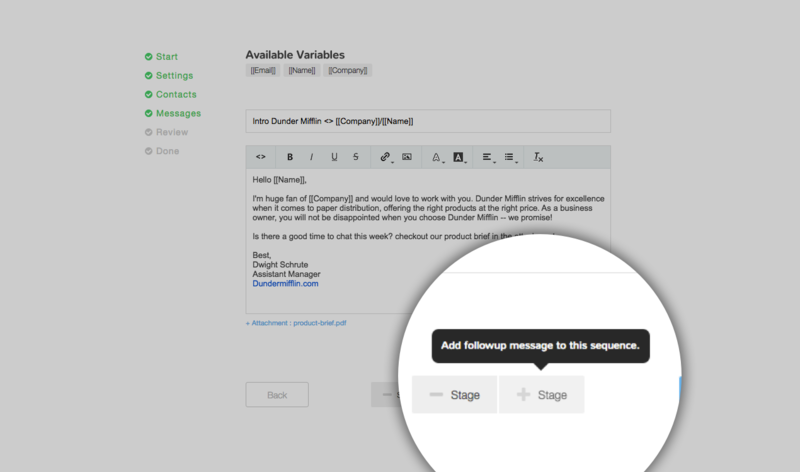 Vocus.io Mail Merge allows you to send hundreds of personalized emails with just few clicks. Whether it's a simple one-off message or a complicated multi-stage campaign with attachments, you'll be able to launch them in no time. Create a new campaign from Dashboard > Mail Merge and upload a CSV file. The CSV file must contain an 'email' column, and any number of columns that will be available as variables in your message body and subject line. You can schedule your emails to be sent out at a specific time (such as tomorrow 8am), allowing you to land on your leads' inbox at the right time. Vocus.io will record all email opens, clicks, and replies. You can easily create multiple campaigns and A/B test your message across the same audience profile. 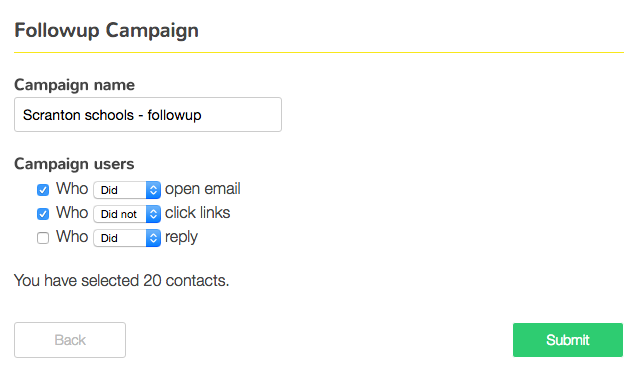 Users under the Professional Plan will be able to add and schedule automated followups for their campaigns. An automated followup (could be a "gentle reminder" or more substantial message) will be sent to non-responsive leads after a number of days that you specify and exactly at the right hour. With the right sequence of messages for the right audience, your reply rate could easily double after each followup. You can include an attachment with your messages, whether the first message or subsequent followups. Attachments could be anything from PDFs to ZIP files. Classical mail merge apps will include your attachments as embedded links, which is an effective way to tell your leads that they are part of a mass email campaign. 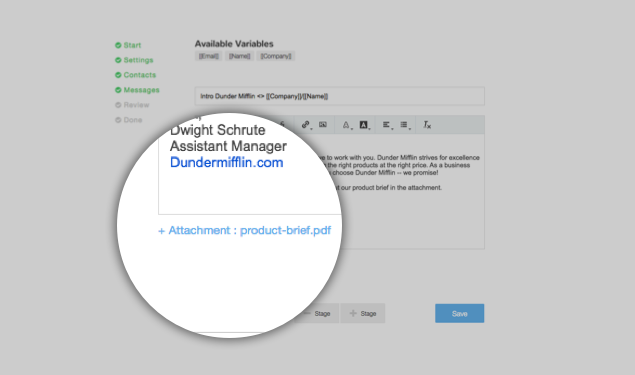 Vocus.io on the other hand will include your files as real attachments (not embedded links), exactly how they'd look if you personally sent that email message. Often times you have a lot to say and your leads have little time to read. What if you can create a personalized slide deck for each lead? Vocus.io is the only outreach tool that can generate a personalized slide deck for you lead that will help you convey your pitch, capture their attention, and signal how much you care. It's like PowerPoint for Mail Merge. See this page for additional details. You can edit a scheduled message/followup anytime, which is especially useful when you get hold of a better email copy or product updates. You can also pause the campaign or remove individual contacts from subsequent messages. Need more analysis? download a detailed CSV file showing the stage and metrics for each contact. This is accessible from Mail Merge > Edit & Actions (top right). When creating a campaign, you can specify whether to log outgoing emails to your CRMs. Vocus.io supports native Salesforce integration as well as auto BCC for other CRMs. Vocus.io allows you to duplicate a campaign and target a subset of leads from previous campaigns based on their behavior. For example, send additional information to those who opened the email and clicked on links but didn't reply. Alternatively, you can replace with a fresh one, which is a good way to recycle your well-crafted email sequence. Users in the same team are able to share mail merge reports, showing how many emails were sent/clicked/replied. This is a great way to keep everyone up to date on the performance of all the outreach activity and rally the team behind that goal.